IN June 1999 the developers of the new Lisburn Square project on the site of the towns swimming pool site were hopeful work on the multi-million project would start in October. Lisburn Council were liaising with developers CUSP. IN June 1985 Assemblyman Alderman Ivan Davis said that the sooner the Department of the Environment entered into an agreement with Lisburn Borough Council on a proper financial basis in relation to grass cutting and weeding the better it would be for everyone concerned. Alderman Davis said in a statement that the condition in relation to overgrown grass and weeds alongside Queen Road was a disgrace. In July 1969 more than 500 people filed through Barbour Threads factory at Hilden when it opened its doors to the public. 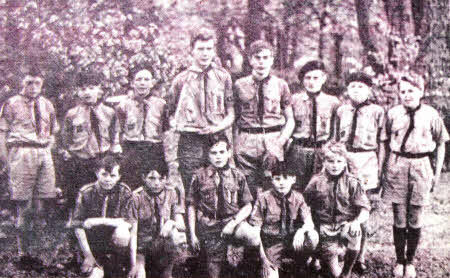 Among the guests who were admitted by ticket were the Mayor, Alderman James Howard and several industrial representatives. And members of the public, including school children, both primary and intermediate standards, and local ministers met in the mill's canteen at two sessions. The parties were broken into groups of a dozen people and were escorted round the recently modernised mill by members of manufacturing departments who acted as guides, explaining the various processes involved in bringing raw materials up to the finished product. The tours lasted 40 minutes and the guests were then brought back to the canteen where they enjoyed a cup of tea and viewed an exhibition of linen and synthetic threads. SAFETY measures on the Moira Road were at the centre of discussions in July 1969 when the Ministry of Home Affairs wrote to Lisburn Borough Council about the road where 23 injury accidents had occurred in the past three years on a section less than a mile long. The area under discussion was the section from the Ballinderry Road and it was said an examination of the road suggested that a more radical measures were needed than the suggested provision of a footbridge. The Ministry said in the letter, read at the council's Traffic Sub Committee, that an order for the introduction of a 30 mph speed limit from a point west of the junction with the Ballinderry Road to the junction with Lower Lissue Road would be laid before both Houses of Parliament at Stormont for approval. They said it appeared extremely narrow footpaths and the thick hedges on either side of the road were contributing to the high accident rate. There were a number of official and unofficial openings in the hedges and it was considered people coming out of these onto the road were putting themselves in danger. It was said a driver had 'no chance' of avoiding a child who dashed out from one of these gaps onto the road. However, there had been no pedestrian accidents at Drumlough Gardens during the past three years and that had been taken into consideration by the Ministry in addition to the results of a census of vehicular - pedestrian traffic taken by the police in the area which showed no need for a pedestrian crossing there. 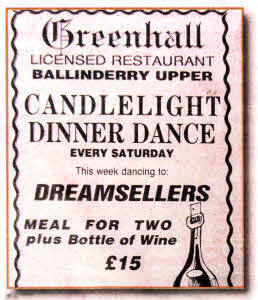 DID you enjoy a night out at the Greenhall Restaurant back in the 80's? This was an ad from the Star in 1989. Sadly, the restaurant has now been knocked down. Cinema goers were shocked when it was announced the Lisburn Picture House, which had been open since 1912, was to close. The premises in Market Square had been bought by the Bank of Ireland. In June 1985 the public of Lisburn helped to pay for the shipment of a large consignment of food aid to famine hit Ethiopia. The £12,720 subscribed through the Mayor's Appeal, initiated by Councillor Mrs Maureen McKinney, was used to buy food transported to Adssab on the ship Link Target. 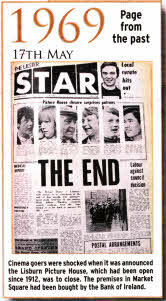 In fact, many Lisburn televiewers may have seen the arrival of the food ship. The Oxfam in Ireland Director praised the Lisburn public for making a most meaningful contribution to saving lives in the human tragedy in Ethiopa and Sudan which spawned the Band Aid single 'Do They Know Its Christmas'. IN June 1999 it was revealed that some of the biggest and most spectacular events ever seen in Lisburn were being planned to celebrate the new Millennium. Lisburn Borough Council had already organised up to 16 months of special events to commemorate the once in a life time celebration and was encouraging people and community groups across the borough to get invoved Lisburn would lead the whole ' province's celebrations.